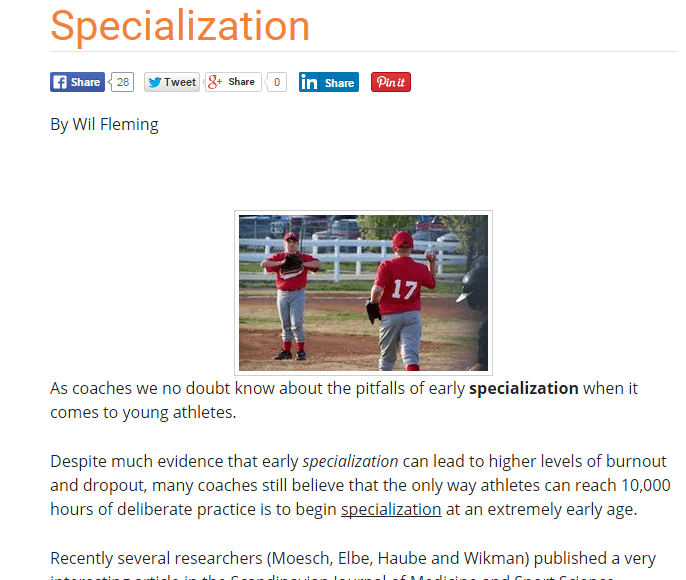 That today, early sport specialization is an epidemic among younger athletes. And it’s caused by a paper tiger need to stay competitive. Nothing fires me up more than coaches NOT allowing their players to play other sports throughout the year. Why Early Specialization in Baseball or Softball May Be Dangerous to an Athlete’s Health. I feel bad for oblivious parents in youth baseball and softball nowadays. Their motivation to “catch-up” to the competition is HUGE because they don’t want to see their child sitting on the bench. And rightfully so. So, what is a parent to do? Spend $100-200 per month on a travel team that promises tournament play every weekend, plus three practices during the week…all year long! The goal is reps, reps, reps. That’s how they see getting to the 10,000 hour mark of sport mastery. I’m here to tell you this approach is VERY misled. When I hear this, I see these parents spinning their tires. Sure, they may get to those 10,000 hours, but at what cost? And does it really take 10,000 hours? Do you subscribe to the 10,000 hour rule of “the more reps the better”, I talked about earlier? You’ve read The Talent Code right? Well, like 3-times NY Times best selling author, Tim Ferriss, says in the video above, most of the time people are spending their 10,000 hours of “deliberate practice”, practicing the wrong things. In this since, it’s not how you study, but what you study that counts. What do we study then? Human movement rules that are validated by science. It’s doing the right things, and then doing those things correctly. So, what does Long-Term Athletic Development look like? Wil Fleming from the International Youth & Conditioning Association (IYCA), which I’m a member of, put out a post that highlighted a recent Scandinavian Study that several researchers (Moesch, Elbe, Haube and Wikman) published in the Scandinavian Journal of Medicine and Sport Science. The near-elite athletes actually accumulated more hours of training than the elite athletes prior to age 15. By age 18 the elite athletes had accumulated an equal number of hours training to the near elite athletes. From age 18-21 elite athletes accumulate more training hours than near elite athletes. Elite athletes said that they passed significant points in their career (first competition, starting a sport) at later dates than the near elite athletes. According to David Epstein, in his book The Sports Gene: Inside the Science of Extraordinary Athletes , it’s a hardware AND software issue. Not just nature OR nurture, but both! You can’t have the latest greatest software on a 5 year old computer, just like you can’t have the latest greatest computer running Windows ’98. Young athletes MUST develop the hardware early, between ages 10 and 15 years of age, which means playing other sports that aren’t one-side dominant like baseball/softball, golf, or tennis. Ideally, Martial Arts, Dance, Gymnastics, Swimming, Football, Basketball, etc. Then, from 16 to 18 years of age or so, it’s smart to start specializing, so the athlete can update their software for that sport. From David Epstein’s research, athletes that generalized early on, did better at the sport they specialized in later, than athletes that specialized in the same sport early on. The latter may have more sophisticated software, but their running it on a 5 year old computer. Here’s evidence, validated by science, that the 10,000 hour deliberate practice rule can be misleading. The key is a well-rounded movement experience for young athletes, at least if you want to give them a better shot at achieving the elite athlete status. This is Long-Term Athlete Development in a nutshell. I played 17 years of baseball as a right handed hitter and right handed thrower. At the time, taking reps on my left side, to me, was a complete waste of time. Imagine going to the gym everyday and doing one hundred-fifty bicep curls with a 30-pound dumbbell using your right arm only. But switch-hitting DOES NOT give as big a competitive advantage that everyone thinks. Of course, switch hitting from the standpoint of a coach writing a competitive lineup, or that switch-hitters are more balanced athletes from a human movement perspective, sure. But not to the performance of the individual hitter. Did Babe Ruth feel the need to switch hit? How about Ted Williams? Do you think Miguel Cabrera, Mike Trout, or Andrew McCutchen feel the need to see a breaking ball “come into” them? A hitter will collect data and make adjustments accordingly, whether they’re facing a righty or lefty pitcher. Not only is baseball or softball one of the most imbalanced sports you can play, but it’s also one of the least active, next to golf. I read or heard a study somewhere that analyzed the action in a 7-inning baseball game, and on average, a player will have 4-minutes of real activity. Now, that’s saying something about the state of this sport! Heck, want to know my thoughts on the increase in pitcher Tommy John surgeries? The move to the 5-man rotation? “Unnatural” torque produced by the body in an overhand throwing position (versus underhand)? In the grand scheme of things, I believe it’s none of these. The damage is being done much sooner than this. The damage is being done when young athletes are choosing (or being forced, in the case of less informed High School coaches) to specialize in one sport. The above bullet points are just the straws that break the camel’s back…or ahem, elbow. Olympic Throwers & Shot Putters. On the 10,000 hour deliberate practice rule – it’s not about reps, reps, reps. It’s not how you study, but what you study that counts. Make sure the hitting information you’re learning is validated by science. For coaching resources, look into the IYCA I mentioned earlier, and the Positive Coaching Alliance. 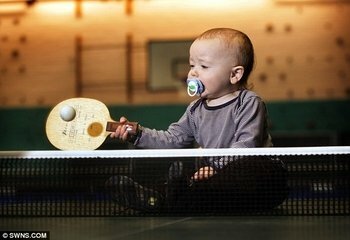 Early Sport Specialization – DON’T do it! The Scandinavian Study proved that young athletes who specialize early will most likely experience burnout and dropout, along with limit the level they can achieve in their sport. Higher Injury Rates – you’re making a BIG mistake when you decide to play only baseball or softball. Make sure to play other balanced sports that I mentioned in the “GOOD (well rounded sports)” section above. It has been a fight but we’ve skirted the hyper-competitive clubs and had our just-turned-13yo continue to play competitive (but not hyper-competitive club) soccer, as well. More than that though, and I was a little surprised to see this not included in your list, he moved from swim lessons to swim team this winter. The explosion in core and upper body strength was amazing and there was no ankle, knee, hip pounding (he didn’t want to and we didn’t encourage butterfly). I’m a huge fan of the sport as a secondary and tertiary activity, now. Interestingly, he was recently asked to be part of an academic study of kettle bell workouts for tweens and teens a the local Big10 university. That, too, strikes me as balanced, demanding of the core and – done properly – all about coordinating and developing many muscle groups. And again, the increase in power and speed has been impressive. Booya Alan! I did forget swimming, definitely on the GOOD list. And yes, kettlebell training (assuming the exercises are done properly) is another great discipline to balance the body out. The point is to take the shoulder, hip, and ankle through full ranges of motion. Develop stability in the core and rotary (or braking) muscles, and to improve squat, lunge, hinge, and single leg movement patterns. For a sport to be GOOD, it would need to do most of this. Great job Alan! Joey … LOTS of food for thought here. I’ve just read the article and will continue to ponder and integrate your insights … and hope to come back and share some additional insights. I enjoy ready your insight and opinions. I coached baseball for years, high school, junior college, and D1, and have moved over to high school fast pitch softball for the past three years. The surge in year round play through all of the “travel teams” is a major concern for me, both for the players’ health, and the health of the high school programs. All too often, I have seen that travel ball includes very little actual coaching and development of players. We’ve hosted tournaments at our school, and many times it looks as if the coach is there merely to make out the lineup. It’s sad to think of all of the money parents are spending for this “experience”…but it’s currently the fad thing. Everybody has to do it. Travel teams are becoming competition for the high school programs. Many of my coaching friends agree that it appears that high school teams in baseball, softball, volleyball, basketball…all of the sports that have the expanding year-round travel teams…are on the way out. With this shift in emphasis and the increasing financial stress on schools, these high school sports, once a staple in our society, may not be around much longer. Wow, great insight on this issue Steve…coming from a very credible source. I’m sad to agree on this, and is where I think school sports are going 🙁 We’re trading higher expertise coaching (schools) for poor expertise coaching (travel ball). We need to find a way to band together on this. Great article Joey. Good timing also. Thanks Nieshka 😀 Glad I could help.